Big Data challenges current message oriented middleware (MOM) applications. MOM usually works with FIFO and priority scheduling disciplines. What happens if there is a large list of URLs ready to be crawled but you want to give URLs at the end of the list a chance of being crawled earlier? This concept comes from genetics, and is used in genetic algorithms selection schemes. The last URLs may contain interesting new resources in spite of their order or priority. Consuming from a FIFO queue takes a long time to crawl these URLs. Priority scheduling is more helpful, but it is not possible to know apriori how useful a URL will end up being in the quest for new Internet resources. Why not add a chance factor to URL selection by using roulette wheel scheduling and an efficient algorithm? Data flows follow an order of execution based on task dependencies. One task cannot start until the preceding tasks have finished. This is the way a spreadsheet works. A change in a cell triggers a series of processes to be completed in topological order. Why not add task dependency to MOM applications? An item can be consumed from the queue only if its precedent tasks have been completed. We provide some data flow resources at the end of the Egont Part II article. However, a new queue scheduling discipline could be used in place of a separate framework. Ideally, the new queue discipline would include features such as persistence and transactions. To the best of our knowledge, there are currently no Internet resources about using a roulette wheel scheduling discipline for a queue. The external interface for a roulette wheel queue is the same as for a typical queue with “get” and ”put” methods except that the “put” method incorporates a new probabilistic parameter. Probabilities can be expressed as integers. When a consumer requests an item, a random number is generated to decide which item is selected. Items with higher probabilities have a greater chance of being retrieved, but even items with low probabilities can be consumed. 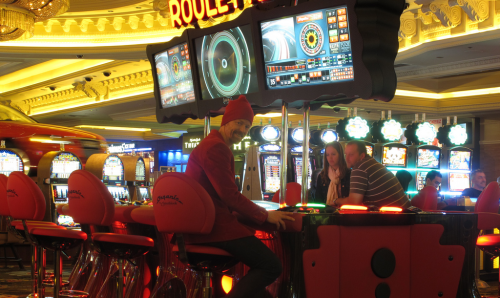 The implementation of an efficient roulette wheel queue is not easy. Genetic algorithms use roulette wheel selection to choose between a small set of alternatives. A queue used for crawling can contain a lot of URLs, and the question is how to take these processes into account in order to find, add, and remove URLS efficiently. Finding an item in a roulette wheel data structure is O(n) for trivial traversing and O(log(n)) using a binary search. Adding an item is trivial, it can be added at the end and the new total is the sum of the previous probability parameters total plus the new item’s probability parameter. Removing an item is more difficult. The trivial, but not the best, solution is to recalculate all the partial sums after the element which is being removed. A better solution is to use a heap tree data structure or one of its variants. An alternative that merits further study is the use of Fenwick trees. In 1994, Peter M. Fenwick discovered how to improve the finding, adding, and modifying of items and the calculation of their subtotals. Since the Fenwick tree works over a fixed range of items, item keys must be preallocated.